If you have been to a potluck in the last 20 years, you have probably had the pleasure of trying Potatoes Romanoff . 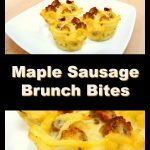 It’s a tasty casserole-type dish with hashbrowns, sour cream, cheese and onions and it was the inspiration behind these Maple Sausage Brunch Bites. And if you are a little bored with the typical breakfast food or looking for brunch potluck ideas, give these a try. They won the Grand Prize in the 2014 Johnsonville Sausage Recipe Contest. They are not only contest winning, they are easy, quick and freeze well. They are also the perfect portable ‘on the go’ breakfast food. Reheat for a quick workday breakfast and cook in aluminum lined muffin cups for easy clean up. 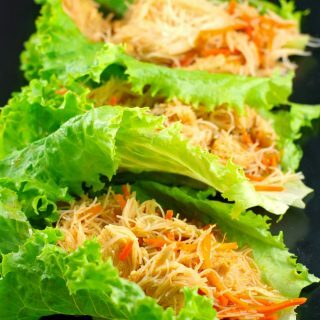 You can use the shredded or cubed hashbrowns (though the shredded tend to hold together better). Or serve them with fruit (and mimosas, of course) and you have yourself a perfect easy make ahead meal for your Mother’s Day brunch. Why not bring them to your next brunch potluck?! Looking for other breakfast or brunch potluck ideas? If you are looking for breakfast or brunch potluck ideas, this Potatoes Romanoff inspired breakfast dish made with hashbrowns, sour cream, cheese, onions and maple sausage is the perfect solution! Cook sausages according to package instructions. Preheat oven to 350 degrees F. Spray 12 muffin cups thoroughly with non-stick cooking spray. Chop cooked sausage links into ¼ inch circles. Cook onion in butter for 2 minutes on high in microwave. In a large mixing bowl, combine the defrosted hash browns, onion cooked in butter, mushroom soup, sour cream, eggs, grated cheddar cheese and sausages. Scoop mixture into muffin tins to the top and pack down tightly with spatula (ensure they are packed to the top to make for easier removal). Bake for 20-30 minutes in pre-heated oven. Remove from oven, let cool for about 3-5 minutes, then run a butter knife around the edge of each muffin cup to loosen the Maple Sausage Brunch Bites. Let cool a full 10 minutes, run knife around edges once more, then carefully remove with a spatula and place on plates. This post is part of the The Country Cook’s Weekend Potluck! Congrats on the prize! I would definitely choose these little morsels in a buffet! These would be great breakfast when we are camping. Easy to hold and yummy to eat. My grandkids will be able to eat and explore at the same time. Yes, they are a great breakfast hand food for kids and my kids LUV them! Help! I need to make these for a brunch tomorrow and I can’t find my muffin pans. They might have been thrown out?? Can I make these in an other pan and what adjustments should I make? I have never made them in another pan, but you could actually try making it as a casserole in your lasagna pan (standard 9X13). I would double the recipe and reduce the eggs by 2. But like I said, I have never tried it, so I couldn’t say for sure. If you do try it, let me know how it turns out. Good luck! Hi! I plan on making these for a bridal shower but want to make them in the mini muffin pan. Are there any suggestions with that? Thank you! Hi Brenda -I’ve never actually made them in a mini muffin tin. However, I would just use 1/2 of what I’d use in regular muffin pans and cook them about 1/2 the time.